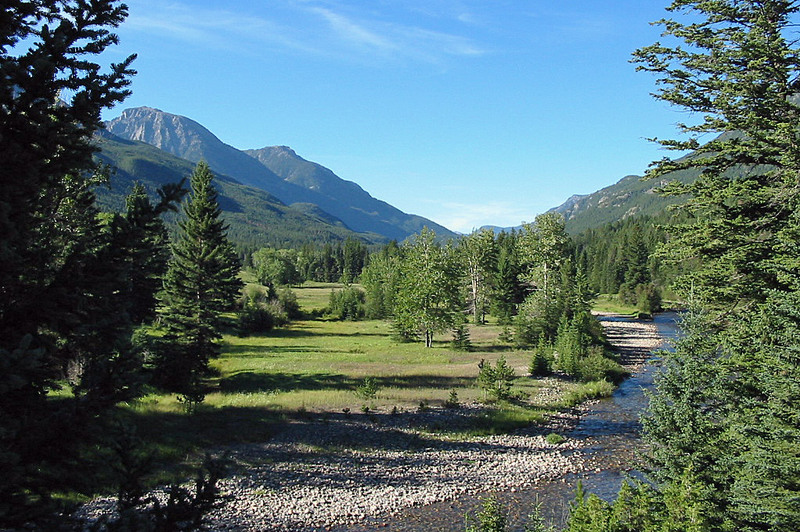 The Boulder River begins in the Absaroka Mountains, and flows due north towards its confluence with the Yellowstone River at Big Timber, Montana. The Boulder River provides decent fishing, a changing scenic backdrop and exciting floating. In short, it is a great place to come on a Montana fly fishing trip. This upper section of the Boulder River has very fast current, lots of whitewater of Class III and Class IV, excellent pools and solitude for the angler willing to walk away from areas where the road nears the river. While it is rather time consuming and a slow drive to access this section, the upper Boulder River is well worth the trip. Thirty miles downstream from its origin, the Boulder River flows through Natural Bridge Monument, a unique waterfall that is well worth taking the time to see. As the Boulder River flows through the monument, the river disappears entirely in a large mass of rocks, re-appearing one hundred feet later in two distinct waterfalls that cascade down more than one hundred feet. The sight of water flowing out of the rocks, not just over it, is a unique site, and well worth the price of the short walk required to see it. 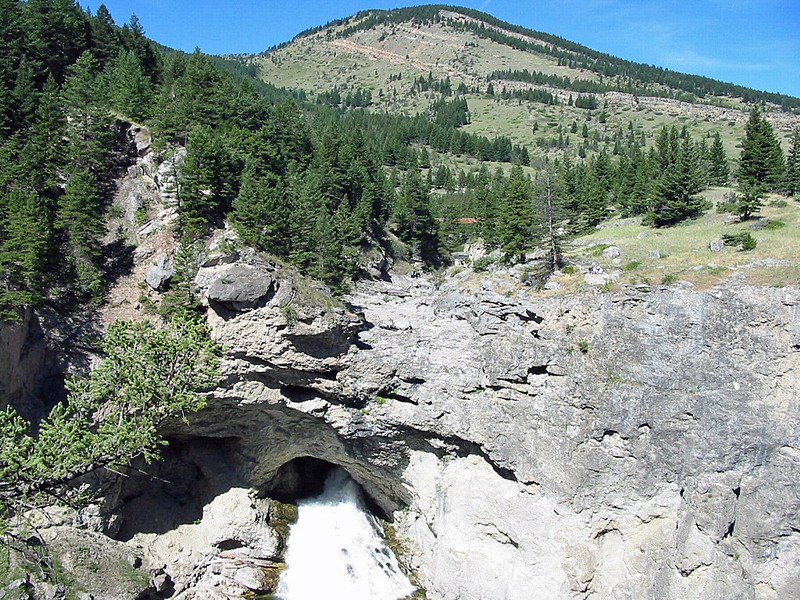 Below Natural Bridge, the Boulder River passes primarily through private land as it leaves the Absaroka Mountains behind and begins to flow through the high plains. The valley just outside of the mountains has extensive agricultural operations. Fields of hay go right up to the rivers edge. The current of the Boulder River also slows. The country becomes much more open, offering excellent views of the surrounding mountains. 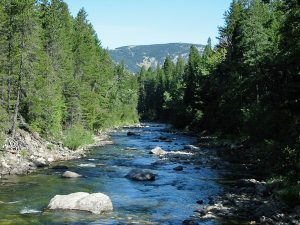 After flowing for more than thirty miles below Natural Bridge, the Boulder River reaches the confluence with the Yellowstone River near the town of Big Timber, MT. The Boulder River offers excellent fly fishing. The rivers out of the way location, combined with its proximity to other major, better known, rivers, tend to keep fishing pressure in the moderate range—not abnormally heavy, but enough people fish it to be noticeable. Thankfully, many stretches of the Boulder River travel through public lands which helps spread anglers around. The upper stretch of the Boulder River, from its origin downstream to Natural Bridge State Monument, is both an easy river to fish and a difficult river to fish. 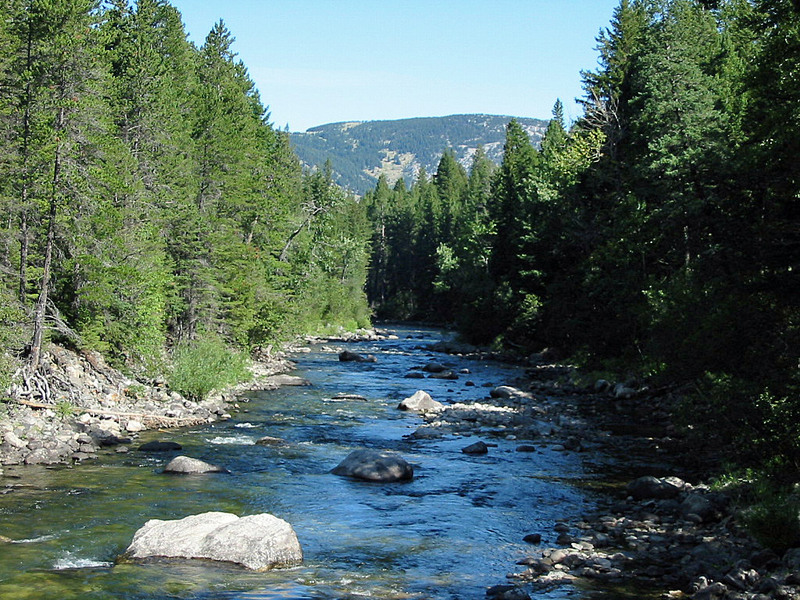 On this upper stretch, rainbows and cutthroat trout are found in abundant numbers, frequently up to fifteen inches. These fish are not picky. They will take about any dry fly or colorful attractor that is presented in at least a halfway decent manner. Spin fisherman will also have success using small spinners in the deep holes found along the Boulder River. What makes this stretch difficult to fish is the frequent narrow width of the river, heavily forested riverbanks, slippery boulders and very fast current. The Boulder River lives up to its name on the upper stretch with boulders of every size everywhere. 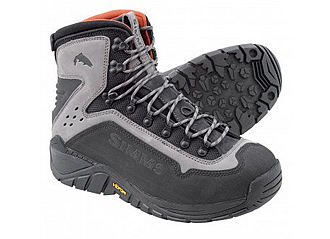 And they are slick, even in good wading shoes. Combine that with a very fast current and some deep pools, and you have some recipes for good wading disaster stories. Fishing from the bank often isn’t an option as the bank is just too heavily forested and bushy for most of its length. The trick to wade fishing in this upper stretch is to be patient and not to hesitate to walk downstream or upstream to find a flatter stretch of water to safely wade fish from. While the walks can be difficult at times, it is generally worth it, especially since the angler willing to walk just short distances is likely to have the water all to themselves for the entire day. Also, a wading staff is not a bad idea on this stretch of river, either. If you don’t have a staff or feel like buying one, a large and heavy stick can greatly suffice in assisting anglers across the more suspect looking areas of the Boulder River. Below Natural Bridge State Monument, the size of the fish greatly increases. Rainbow trout and brown trout predominate, with fish stretching up to twenty-four inches occasionally taken. The trick on the lower section is to reach the fish. Access isn’t the greatest, and no access at all exists for the first ten miles below Natural Bridge State Monument. 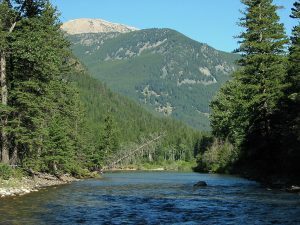 Similar to fishing the upper Boulder River, the wade fisherman who is willing to walk along the bank away from the scattered access points is likely to find prime fishing waters and relative solitude along the Boulder River. Just stay below the high water mark so none of the local landowners have any legitimate complaints. Fishing on the lower stretch is excellent for dry fly fisherman and streamer fisherman alike. Using large streamers in the many deep holes and along the undercut banks is a wonderful way to catch the rivers large brown trout. For the dry fly angler, the Boulder River has excellent caddisfly hatches throughout the summer. Due to the relatively low fishing pressure, standard dry flies like the Parachute Adams and Elk Hair Caddis work very well. And, of course, as the Boulder River flows through ranch country with lots of hay fields, it is also prime hopper fishing water come late July. Just use a large hopper, floating it right along the banks, picking up brown trout and rainbow trout as you go. A person on a Montana fly fishing trip in July should always have lots and lots of hoppers. The Boulder River provides two very different types of float—one for the whitewater enthusiast and the other for the float angler. The Boulder River can essentially be neatly divided into two halves by the Natural Bridge State Monument. The upper half of the Boulder River above the monument is generally narrow, has extensive rapids and is seldom floated. Below Natural Bridge, the river is bouncy but has no major rapids, allowing for excellent fly fishing. Floating any portion of the Boulder River above Natural Bridge State Monument is difficult, and should only be attempted by someone who is experienced using a kayak or very small raft. Additionally, the Boulder River will not be able to be floated at all during late summer, as the river will just be too shallow in spots. As a result, the best time to float the upper section of the Boulder is in late-June and July, right after the high water begins to subside but well before the low water conditions of August set in. If you do plan on floating this section, you may as well leave the fishing pole home unless you plan on stopping on the river at various spots to fish. The current is just too fast and the river to narrow to effectively fly fish from a speeding boat. During higher water, floating on the upper stretch for the whitewater enthusiast can begin at Hells Canyon Campground, which is about ten miles downstream from the Boulder Rivers origin, and will allow for a wild ride down to Falls Creek Campground. For all intensive purposes, the river between Hells Canyon Campground and Falls Creek Campground is whitewater, with slacker, slower water just filling in the gaps. A rafter or kayaker will encounter unending Class II rapids, miles of Class III, and in the upper stretches of this section, more than three miles of Class IV whitewater. Other than the obvious danger posed by the whitewater, the other danger is inadvertently floating right by the takeout point. The Boulder River has a solid current past the Falls Creek Campground, and the campground is not easily noticed from the river in any event. As this is the last takeout before Natural Bridge State Monument (which does not have a takeout before the waterfall), it is quite important to get out here and not go by it. To avoid this, it is suggested that any floaters get out not at the campground, but at the easily located bridge that crosses the river about a quarter mile upstream from Falls Creek. Remember, Natural Bridge does NOT have a take out point. The Boulder River is deep down in a gorge as it flows through the monument, so it is important to get out before reaching the gorge. And the gorge is not floatable. The waterfall and the disappearing act of the river into the rock see to that. Below Natural Bridge, the Boulder River mellows out substantially, making for a nice float while fly fishing. Floating on this stretch begins about ten miles downstream from the gorge, at a bridge that crosses the East Boulder River. Additionally, floaters can access the river three miles further downstream at a public access site along the Boulder River itself. Regardless of where a floater puts in, the lower Boulder River provides a relatively easy float. No major rapids exist, although lots of riffles and smaller Class II rapids can be found. Watch out for irrigation lines and fences, though, as a couple of each can occasionally be found crossing the river in seemingly different places each year.